Now being considered as a very admirable person, Kayla Montgomery is claimed to be one of the fastest long distance runner in the US. What makes her even more admirable in the eyes of many is her back story before obtaining the success that she is now experiencing and it is all about how she was able to fight and pull through against an illness which always manifests its self during her races. Kayla was just a ‘normal’ kid who deeply enjoyed sports when she was just starting but everything changed when she collapsed one day while she was playing. Kayla was later diagnosed with autoimmune disease “MS” or multiple sclerosis after it was seen she could no longer control the movement of her legs at such a young age of fourteen (14). This disease of hers is said to attack the nervous system, causing problems with the motor coordination and movement of her body. She was depressed for months, with her worsening problems she encountered with walking but after a while, through the help of medication, she began to once again feel sensations on her legs. That was when it hit her. Montgomery came into realization that there was no point in pitying herself and in getting mad at God for giving her this unwanted ailment. Instead of giving up, she decided that she wanted to get back to sports. Sadly, she could not join ball sports anymore because such contact sports could easily cause her more problems. Then, a ray of light came into her life. A running coach took her in. This coach soon became the central part of her life and became her second father. 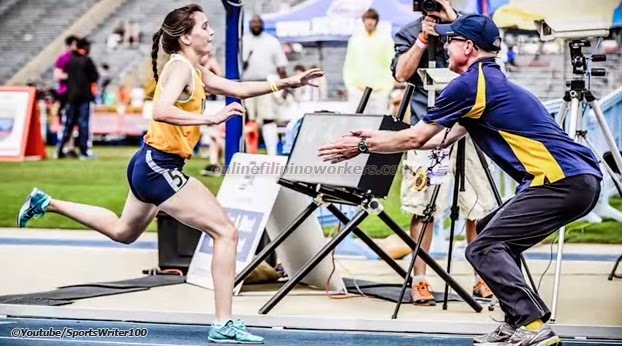 Montgomery is now fully aware that she will collapse every time after a race and this coach would also be the same person to catch her every time she reaches the finish line, with the guidance of her coach Patrick Cromwell. As a result, Kayla’s improvement has been overwhelming. Watch the full story ''E:60' - Catching Kayla' of SportsWriter100 below. Fighting with her illness while at first striving as an ordinary runner, Montgomery is now not only the fastest runner the state among others, but she also serves as an inspiration to many other like her—that illness is not a hindrance to one’s dreams as long as there’s perseverance and determination to overcome it.